What is the NeuroMovement Practitioner Training Program? We'd love to hear from you! Call us at 702-945-6444. In today’s world, we are often taught to work harder, longer, stronger, faster, and then repeat: harder, longer, stronger, faster; repeat. This type of approach is what many of us have come to value and what we believe is the way to succeed in life. NeuroMovement® is exactly that—a new paradigm for how we access our unlimited potential in every part of our life. It is a Method that provides us with a way to access new solutions to problems from a completely different place than what we’ve been taught our entire lives. It’s a huge paradigm shift in how we approach learning and life. Instead of harder, longer, stronger, faster…We need slow. We need gentle. We need attention. We need variation. We need imagination and play. Learn more about NeuroMovement® and the 9 Essentials, the keys to tapping into the potential of your brain. 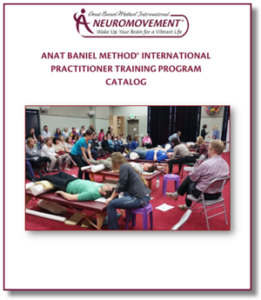 Anat Baniel Method International offers NeuroMovement® Practitioner Training Programs consisting of a unique blend of both in-person and online learning. For over 30 years, Anat Baniel has been challenging herself to find new ways to make the knowledge and the practice of NeuroMovement® readily and easily accessible to future practitioners. Anat Baniel is known for her ability to make her knowledge accessible experientially and theoretically. She is able to convey the seeming miraculousness of the work, while never compromising depth, accuracy, richness, and complexity. Anat has found multiple ways of making the work understandable, fun, intriguing, inspiring, and always cutting-edge and transformational. She works in close collaboration with a highly skilled team of trainers, and her students are inspired and empowered to become powerful practitioners in their own right. Learn More about our NeuroMovement® Practitioner Training Program. Anat Baniel Method® NeuroMovement® is a cutting-edge, science-based approach that transforms the lives of children and adults, helping them move beyond pain and limitation. By accessing the amazing powers of the brain to change itself the method helps people discover how to improve the mind and body dramatically enhancing physical, cognitive, emotional and creative performance. With this gentle approach we do not focus on limitations. We connect with children and adults wherever they are at, and provide the brain with the conditions it needs to wake up and create new connections. This Method leads to extraordinary breakthroughs in physical, emotional, and cognitive performance, often making the seemingly impossible possible. Who Can Benefit from NeuroMovement®? Next Steps: How Can You Make an Informed Decision When Applying to the Practitioner Training Program? 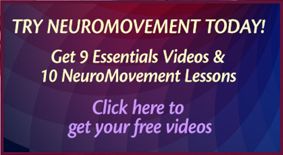 Sign up to get 10 free NeuroMovement® video lessons + video introductions to the 9 Essentials. Read Anat Baniel’s books Move Into Life and Kids Beyond Limits—download free chapters here. Start using the 9 Essentials in your daily life. Get our free eBook. Purchase one of our NeuroMovement® video programs. We recommend starting with our foundational program NeuroMovement®: Whole Body Fitness. Attend one of our NeuroMovement® Workshops. Find a NeuroMovement® Practitioner to work with or come to the ABM Center in San Rafael, CA, for a consultation and private lessons. Discover an Exciting New Career!